If you are short of time, the answers to the following 3 questions should let you know all you need to about the Sonicare for kids electric toothbrush (HX6321/02). If I have missed something, let us know in the comments. 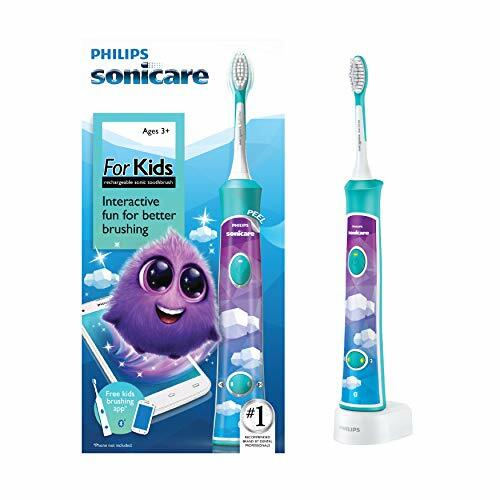 If you want more detail, you can read our full Sonicare For Kids Connected review further down the page or watch our video review. Although I would have like to have seen a couple of extras in the box. My honest opinion is not to consider any other, I think this is the best brush out there for kids at the moment. However, there others you can consider, one of the best being the Oral-B Stages Power (view on Amazon). Sadly, there is no Bluetooth connectivity, but there is a similar level of interaction and focus on achieving the best brushing routine for children via the Disney Magic Timer app. Brushes come in different designs featuring popular Disney characters. There is too, the Pro-Health Jr, for those on a budget. 3. Where is the best place to buy the Sonicare for kids connected toothbrush? This brush is stocked by many of your favourite stores including Walmart, Best Buy and Amazon. We have listed several retailers below, and it’s always worth checking out eBay too. Our research has shown that they are typically similarly priced, but Amazon tends to be the best for keeping prices as low as possible. Technology has made learning and education more fun, interactive and rewarding for children. The problem is that there is now a high standard and expectation from children when it comes to learning something new. Getting kids to brush their teeth can be a real struggle for parents as young children just do not understand the importance of proper and regular brushing. Thanks to the Sonicare for kids connected toothbrush things are a lot easier. It uses Bluetooth connectivity and a smartphone app to get your beloved offspring brushing their teeth perfectly. A very fun and interactive game centred around the main character Sparkly, gets the kids engaged and wanting toi brush better and for longer. There is only 1 version of the Philips Sonicare for Kids Connected Electric Toothbrush, model number HX6321/02 which I am reviewing here. However, there have been other Sonicare for Kids electric toothbrushes that do not have the Bluetooth Connectivity feature that make this brush so special. But, the current for kids range has been refined to just this connected version. The availability depends on the time you are reading this and where you have seen the product. The HX6382/07 was the main alternative, which did not have the Bluetooth connectivity and came with both a standard and compact brush head. Travel case – No travel case included, just a small travel cap. Where electric toothbrushes for adults tend to be finished in White or have soft pastel shades, the Sonicare for kids connected brush employs much bolder colours, as is typical for children’s products. Bold and eye catching, the primary being being Green/Turquoise, or Aqua as Sonicare call it. The back and sides of the handle are this Aqua colour, with the rear having a large number of raised dots that run down from the top to the bottom in essentially 3 rows, with each dot staggered in its positioning. Surrounding these buttons and dominating the front of the brush is a White panel, which is a gloss White and smooth to the touch. However, this is where the Sonicare for kids gets interactive. Provided in the box is a gloss White plastic panel, which itself fits around the buttons and the front panel of the brush. But, also included is a sheet of 10 stickers, which fit to this removable panel. Children can chose the sticker they like most, stick it to the panel and hey presto the brush is now even brighter, bolder and more personal. Parents will really need to do the fitting of the stickers. 28 extra stickers (2 sheets of 14) of Sparkly, the character from the app are also provided, in various sizes. Kids may want to stick these to other things. Thanks to inductive charging, the battery inside the brush charges without having to physically connect a power cable to the handle itself. Itis possible to get up to 3 weeks use from the brush in between charges. More on this in the battery section of the review. In the box with the brush handle is a single brush head, this is the standard sized kids brush head. There is a compact sized head which is perfectly suited to younger children, but this is not in the box and has to be purchased separately. Given that this brush is for kids aged 3 years and older, it would be nice to have the smaller head suitable for these young ones in the box ready, but sadly not. Whilst the smaller head is better for younger children, it is up to you or your child as to which is more comfortable or best to use on a daily basis. The larger head is likely to be better for those children aged roughly 6 years and up who are more independent and able to brush on their own. The heads can be purchased in packs of 2 and cost roughly $20, making each brush head $10 each. HX6032/94 is the official Philips Sonicare product code for a pack of 2 smaller heads, whilst HX6042/94 is the code for the standard sized heads. Because they are designed with children in mind, unlike the regular Sonicare brush heads, these are finished with a rubber coating that not only matches the colour scheme of the brush but makes it softer on the mouth and gums of children, than the normal plastic finish. You might be interested to know that the full range of Sonicare brush heads fits onto this brush handle. You do not necessarily have to use those designed for kids. Download the free Sonicare Kids app from the Google Play Store or iTunes and the toothbrush connects via Bluetooth to your mobile device, be that a smartphone or tablet. Your mobile device must have Bluetooth 4.0 to work. Wired into the charging unit is a power cable that is about 1 meter in length and has a 2 pin connector on the end of it. Plug it into the mains socket and you are good to then charge the brush. Should it be completed discharged a series of 5 beeps will be heard twice. The brush will not function and it must be put on the charging stand. 3 weeks is a good battery life. You might be thinking that all these features come at a price and they of course do. The retail price is $49.99, which I think is actually very good given what you get and when you compare it to an equivalent adult toothbrush. However, better still is that the typical selling price is about another $10 less, with most stores selling it for $40. We have listed a range of retailers here. Your view may well be different, but I think this is excellent. One extra factor to consider here is the cost of brush heads. These need to be replaced every 3 month’s and the average price per head is $10. Assuming an average purchase price of $40 for this model, plus the cost of the replacement brush heads over 3 years, you are looking at a total outlay of $150, which is $0.14 per day. It is logical to make comparison to Oral-B equivalent. By going with Oral-B you might be roughly $20-30 better off over 3 years, but I think the premium is well worth paying given what is on offer here. This brush is stocked by many of your favourite stores including Walmart, Best Buy and Amazon. This is pretty much as close at it comes in my mind to being the perfect electric toothbrush for kids. It is a bold, funky and interactive toothbrush that is fun for kids of all ages, but offers an educational factor too. A smaller brush head and maybe a travel case would have been nice, but the price is reflective of you get. With the brush you get a standard sized brush head. This has been designed for children, with a rubber backed shaft and soft bristles. Sold separately is too a compact version of the head suitable for younger children. Sonicare adult brush heads, designed for adults do too fit on and could be used on this handle.